Pacific rockfish are a slow growing species that typically live 30 to 60 years. They range from Baja California to Alaska and are primarily harvested by offshore trawlers, although a small but growing amount comes from inshore boats using long lines. 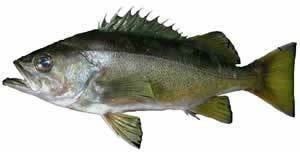 While pacific rockfish are often called "snapper" and/or "rockcod" locally, neither term is accurate in describing the genus Sebastes. Pacific rockfish belong to the family Scorpaenidae, while cod belong to Gadidae and snapper belong to Lutjanidae. They are available all year round, although summer is the time of year when they are most abundant and prices are lowest. It is a pacific coast fishery, so the storms of winter can make it a little harder to come by at that time of year and prices tend to rise. You will not find any of the long line product during the winter months. Pacific rockfish are an excellent choice for almost any manner of preparation. They are most typically sold in the form of fillets, which can be baked, steamed, broiled, deep-fried, or microwaved. They also make a good addition to stews and chowders. The flavor is very mild, as is the meat of most white-fleshed fish, but its texture is distinctly flaky.